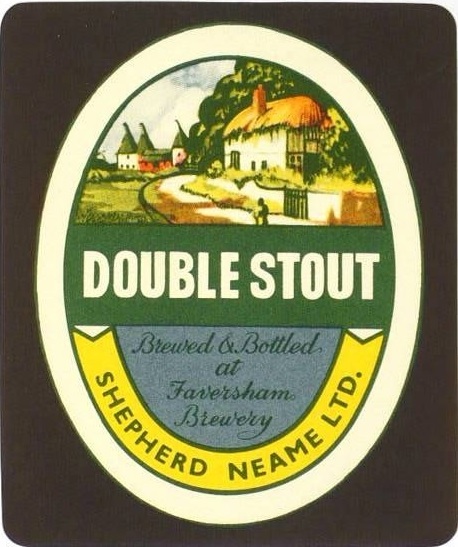 As most other breweries of the time, Shepherd Neame brewed Stout. Two Stouts, in fact. This is the stronger of the two. Not that it’s that strong, though it is about the same strength as a draught London Stout of the period. I’m pretty sure this was exclusively a bottled beer. Outside of London and Ireland there wasn’t a great deal of draught Stout. The grist is pretty simple. There’s just one coloured malt, black malt. This was fairly typical of provincial English Stouts. In London they stuck with brown malt, but elsewhere it had mostly been dropped in the 19th century. The presence of oats – rolled in this case – tells me that it was sometimes marketed as Oatmeal Stout, which was popular at the time. It’s not a huge amount, but more than London brewers used. No more than 1% of their grist was oats. The invert sugars are substitutes for proprietary sugars called CS and FC. The combination of No. 3 and No. 4 invert does at least get it to about the right colour. The hops are a guess again. All I know for sure is that they were English, presumably from Kent. I’ve reduced the quantity because they were from the 1937, 1938 and 1939 seasons.